Covered by Hitachi's Lifetime Lithium Ion tool warranty, the WH18DGL 18-Volt impact driver is a powerful, yet compact addition to the 18-Volt Lithium Ion cordless tool series. Even at about six and half inches in length and just 3.1 lbs, this impact driver has the power to drive stubborn screws and bolts, and can do so in tight quarters. With 1280 in/lbs of torque, up to 2400 RPM and 3200 impacts per minute, there are few jobs the WH18DGL can't handle. 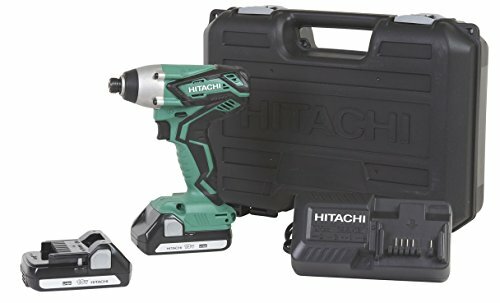 This tool comes standard with two BSL1815S lithium Ion slide-type batteries.Throw in a built-in LED light, an extremely ergonomic design, and a free standing battery design-for sitting upright between uses-and you have an impact driver with the power, quality, and design that users have come to expect from Hitachi.